Everything needed to conduct comprehensive professional development for teachers of gifted students. Schools will get the benefit of in-person author workshops for a fraction of the cost with this comprehensive resource. 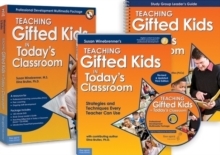 Teachers will be introduced to proven, practical classroom strategies for meeting the needs of gifted learners, whether they work in a mixed-ability classroom, cluster classroom, gifted-education classroom, resource room, or another setting.